What’s The Best Vacuum Sealer For Sous Vide? 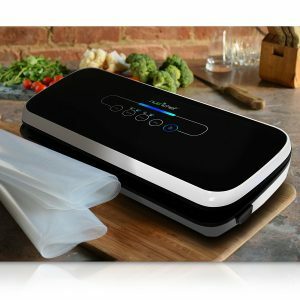 Home General What’s The Best Vacuum Sealer For Sous Vide? How Sous Vide Is Quickly Changing The Game! Sous vide cooks food perfectly by maintaining a constant temperature! You seal your food, place it in the water bath, set your temperature and walk away. Imagine you were cooking a steak this way…..every single fiber would be cooked to perfection. The edge, the center, the side…..all done exactly the way you want it! While I have you salivating, there’s more to this whole sous vide thing. Not only does sous vide food taste a gazillion times better than regular cooked food, it’s also a heck of a lot healthier. How? No Oil, No Char—Fried food is cooked in oil….I don’t need to tell you how unhealthy that is right? What about grilled food on the barbecue? Definitely a healthier alternative to fried, but still not good because of the charring (known to be carcinogenic). Sous vide on the other hand? No oil, no char! Food cooks in its own natural juices (fats and oils). Check out the video below from Thomas Joseph (all credit to Everyday Food). Retains All The Goodness—Unlike traditional cooking methods, sous vide ensures you retain all the goodness in your food (vegetables, fruits, meats). In the case of vegetables you retain all the nutrients, and in the case of meats, all the natural oils and fats. By far my favorite thing about sous vide cooking is the consistency. Your results are repeatable, and you can produce the same tasting steak time and again! Do You Need 100% Vacuum For Sous Vide Cooking? Is 100% vacuum required for sous vide? It’s a debated question with answers on both sides of the spectrum. Sous vide literally translates to “under vacuum”, so you would think a vacuum seal is necessary. But is it? My honest answer is……yes and no. Confused? Allow me to further elaborate! Before I talk about why you need a 100% seal, lets discuss the importance of a seal. Vacuum sealing is a process which removes air and moisture, prior to sealing the package closed. When you place the package/bag into a hot water bath, heat will transfer from the hot water, through the bag, and finally into the food. Usually a vacuum sealed pouch assumes the shape of the food sealed inside of it. As such, the vacuum seal not only ensures a more efficient cooking process (better heat transfer), but also one that is uniform. A Drop In Efficiency—Without a seal, you have now added an extra layer in the heat transfer process: air. Heat must now transfer through small air pockets before it reaches the food. Uneven Cooking—Because the air pockets are unevenly distributed around the bag, the food may cook unevenly if not left for a long time in the water bath. Too Much Air Can Cause Floating—If you’re bags/pouches have a lot of air, they will start to float. Floating bags are a definite no no. You might as well cook on a pan or fry the damn thing, because it ain’t sous vide if it’s floating! Here’s the answer vacuum sealer manufacturers don’t want you to hear. I’ll say it anyways! You don’t need a vacuum sealer to effectively cook sous vide. 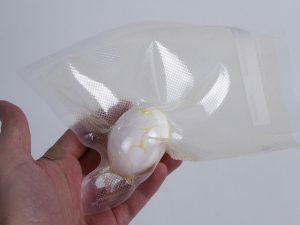 Many people have experimented sous vide cooking with traditional zip lock bags, and found the results to be very similar to a vacuum sealed bag. In fact, certain foods tasted better when cooked in the non vacuum sealed zip lock bags! ChefSteps shows how it’s done below! But I Still Recommend You Get One! Removing oxygen and creating a vacuum seal means meats and vegetables will no longer oxidize. What this means is that your vacuum sealed food will last for eternity. No oxidation no freezer burn, unlike food in a zip lock. This alone is reason to invest in a vacuum sealer! In my opinion, vacuum sealed sous vide cooked vegetables taste better than non vacuum sealed. Again, this may be attributed to the retention of all the juices and flavors, which would otherwise be lost in a non vacuum zip lock. Steaks tend to cook more uniformly when placed under a vacuum. If you’re not too concerned with how your steak is done, this may not be particularly important to you. 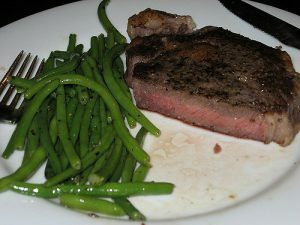 On the contrary, if you like your steak cooked to perfection (I am picky about this), then you will care. In the end, it really depends on your preference! Hopefully all this makes a little more sense now! Here’s an awesome article from ChefSteps that provides an unbiased view on vacuum sealing versus non vacuum sealing for the purpose of sous vide cooking. I encourage you to check it out! Below I go over the best vacuum sealer for sous vide! 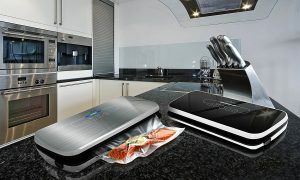 NutriChef Automatic Vacuum Air Sealing System—The Best Vacuum Sealer For Sous Vide! 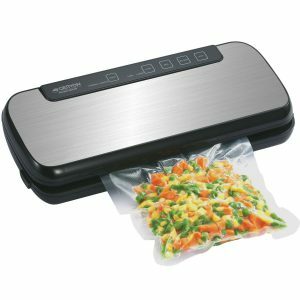 By far the best vacuum sealer currently on the market. It’s affordable, quick to seal, simple to use, and looks and feels awesome! Pros and cons below. By Far The Best Vacuum Sealer For Sous Vide! One Of The Quickest Vacuum Sealers You Will Find! For me vacuum sealing has to be a quick affair, otherwise I’m not doing it. I may as well place my steaks in a zip lock and be done with it. That’s not the case here, and this doesn’t disappoint. It takes only a couple minutes to fully seal a thick juicy rib eye steak with the NutriChef. It could be even faster if you don’t count the time it takes to place the meat in the bag. The quick speed becomes especially important when you’re vacuum sealing multiple bags. A big advantage for those of you who preserve several batches of meats/vegetables at a given time! Also One Of The Easiest! Stop—Pretty self explanatory. Hit stop if for any reason you wish to stop/interrupt the vacuum process. Mode—You can cycle between two modes: normal or gentle. I’d only use gentle for softer foods such as fish, tomatoes, boneless chicken…pretty much anything that is likely to get squished/crushed easily. For everything else, I would recommend using the gentle option. Food—Again you have two modes: dry or moist. If you’re sealing salmon for example, you’ll want to select the moist option. If you’re sealing a dry food, say corn cob…..select dry. Again, pretty simple. Seal—Hit this button if you want to seal only (not vacuum and seal). An awesome little feature to have, as it allows you to double seal your bags. Don’t know about you, but I always double seal! Vacuum Seal—Hit this button to vacuum and seal your bag all in one single step. Love The Touch Sensitive, LED Lit Display! And that’s all there really is to it. Plug in, pick from normal/gentle and dry/moist, and start sealing those bad boys up! Reasonably Priced, Unlike The Many Others! If I’m buying a vacuum sealer for sous vide, it better be reasonable. Why? As mentioned earlier in the post, I don’t really need one. Yes, a vacuum sealer definitely helps improve the cooking process, but one can use zip locks and achieve similar results. To me it just doesn’t make sense to pay $100+ for one of these devices! Having said that, the NutriChef is quite affordable (click here to check latest pricing on amazon) in my opinion. Lightweight, Easy To Store, And Stylish! For those of you wondering, the unit is fairly small measuring 14.1” length x 6” width x 3” height, and it weighs about 2.9 lbs. This isn’t something I’d put away in a cabinet or kitchen drawer, however. It’s probably something I’d leave on my counter, simply because I love the way it looks. It looks especially cool when the unit is powered on, with the blue LED lights and the black finish. If you’re not a fan of black, you can also find this unit in a silver, or stainless steel type finish. Cool Enough To Sit On Any Counter! You Also Get An Air Suction Hose & A Wine Stopper! Don’t care too much for the wine stopper, because I hardly drink wine to begin with. However the few times I’ve popped open a bottle, the cork has either gotten wrecked or lost, which means I now have to finish all the wine…..no problem with that! In all seriousness, if you drink lots of wine this may be the best way to seal your open bottles. The air suction hose is useful if you have vacuum sealing containers. I don’t have vacuum sealing containers at this time, although I’ve been wanting to buy some for a while now. When I do eventually get some, this will be extremely useful, especially because I store a lot of my food stuff in tupperware to begin with! The seal width is a little too thin, so you may need to double seal your bags (especially when cooking sous vide!). Not the biggest deal in the world, but needs to be mentioned nonetheless. Word of advice: double seal your bags anyways! You create an extra barrier for your vacuum sealed food: If one seal breaks, the other one is there to ensure nothing leaks. If you’re looking at getting the best vacuum sealer for sous vide, you should seriously consider the NutriChef discussed above. In my opinion, there’s none better in the market. The 2 sealers below which are also very good, are my 2nd and 3rd choices. Eerily identical to the NutriChef. Everything from the button layout to the way this functions is very similar to the NutriChef, with one major exception: suction power. When it comes to suction power and the ability to create 100% vacuum, this falls short in comparison to the NutriChef (not by much though!). That’s not to say it’s a bad device, especially for anyone who doesn’t wish to spend much. Also, they offer lifetime warranty and support, which I think is pretty cool. 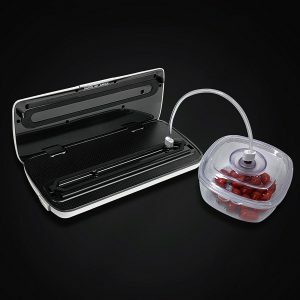 Geryon Vacuum Sealer: A Great Alternative For Those Who Don’t Wish To Spend Much! 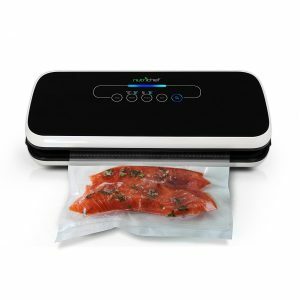 Another really cool vacuum sealer that’s effective, and easy to operate. There’s one thing in particular I love about this: the ability to pulse vacuum. The pulse function allows you to control the vacuum process i.e. you decide how much air is “sucked” out. This is especially useful for softer foods such as cakes, crisps, and fish. From a sous vide standpoint however, you’d want to create as tight a vacuum as possible (so no real benefit). It comes with a 3 year manufacturers warranty. Overall a good device, but definitely not the most cost effective in my opinion. Crenova VS100S: My Favorite Thing About This Is The Pulse Vacuum! I’ve provided you my recommendation on what I think is the best vacuum sealer for sous vide, but there’s still some factors you ought to consider before buying. Let’s take a closer look at these below! 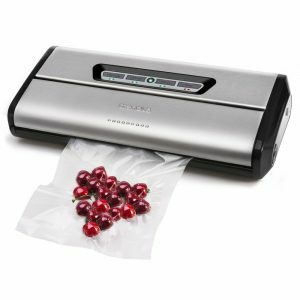 Most vacuum sealers throw in a couple starter bags for free, but you’ll eventually need to purchase more. I’ve found the starter bags don’t hold too well for sous vide anyways, so I’d recommend you purchase bags right when you get a sealer. “What’s the best bag for sous vide”? Glad you asked! Here’s an entire post that addresses the question. Go check it out. #2 Do You Really Need One? How often do you cook sous vide?—If it’s something you do often, I’d recommend investing in a vacuum sealer. On the contrary, if you only cook sous vide a couple times in a year, it’s really not worth your while investing in one. Do you preserve lots?—To justify the cost of purchasing a vacuum sealer, you need to be preserving a lot of food. 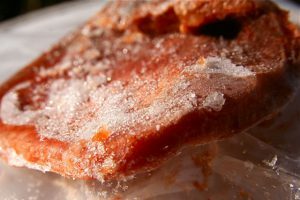 Do you preserve and freeze meats, fish, and vegetables for months at a time? If yes, consider purchasing a sealer to avoid freezer burn and oxidation. If no, and you only have a couple steaks in your freezer at any given time, you probably don’t need a sealer. Will you use the sealer for other reasons?—Vacuum sealers are more than just for sous vide. People also use them to seal documents and clothes, for example. Sealing tupperware is another popular use. Do you see yourself using a sealer for more than sous vide? #3 Don’t Splurge $$$ On A Commercial Sealer! All 3 vacuum sealers I’ve shared above are not only affordable, but incredibly effective. You should have no reason to splurge on an expensive commercial option! Here’s a general rule of thumb when it comes to sealers: don’t surpass the $100 mark. It’s just not worth the extra $$$! I hope you take this advice seriously. #4 Once You’ve Decided, Check Out Multiple Reviews! Once you’ve decided on a vacuum sealer, be sure to check out multiple reviews. Also a good idea to watch product demonstrations on YouTube. Go On, Get Your Sous Vide On! How do you sous vide? Do you use a sealer? If yes, do you see any notable differences? Leave it in the comments! Hope you enjoyed reading. If you did, a share would be appreciated! Unsure about something? Leave me your questions and comments, and I’ll be sure to get back to you!